I am back on track with my usual Friday reviews. But first, I want to weigh in on who I think will be nominated for Academy Awards, which will be announced on January 16th (the awards will be telecast on March 2nd). The Golden Globes have already announced their nominations, and though Academy Award nominations often follow suit, not always, and I think there were some major omissions this year. Plus the Golden Globes divide films into dramas and comedies, thus making many more nominations for Best Picture and Best Actor and Actress than the Academy Awards will. And I have to add, these were my nominations before the Golden Globes were announced, I promise! So here is what I think some of the nominations will be. I am only going to put in three nominations for Best Supporting Actor and Actress, because in the famous words of Bill Murray on Saturday Night Live's Weekly Update, "Who really cares about this award anyway?" Best Actor: Chiwetel Ejiofor, though I think Tom Hanks outdid himself in "Captain Phillips," especially the last 15 minutes of the film and Christian Bale was, well, Christian Bale, the chameleon. This is the deep category this year. Best Actress: Sandra Bullock should never have won for The Blind Side. She should win for "Gravity," EXCEPT here comes old Meryl Streep again and she gives an amazing performance, but of a very unpleasant character. The Academy doesn't usually like unpleasant characters. They could cancel each other out and Thompsom or Dench could get it. 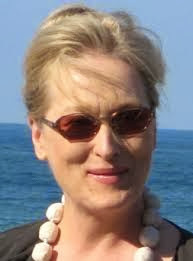 But I am voting for Streep. Best Supporting Actor: I am completely against first time actors and children winning Academy Awards, so that eliminated Abdi. 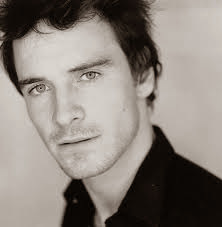 Though Leto was amazing (he's come a long way from his "My So-Called Life" days), I am banking on Fassbender to win. He was just astonishing. 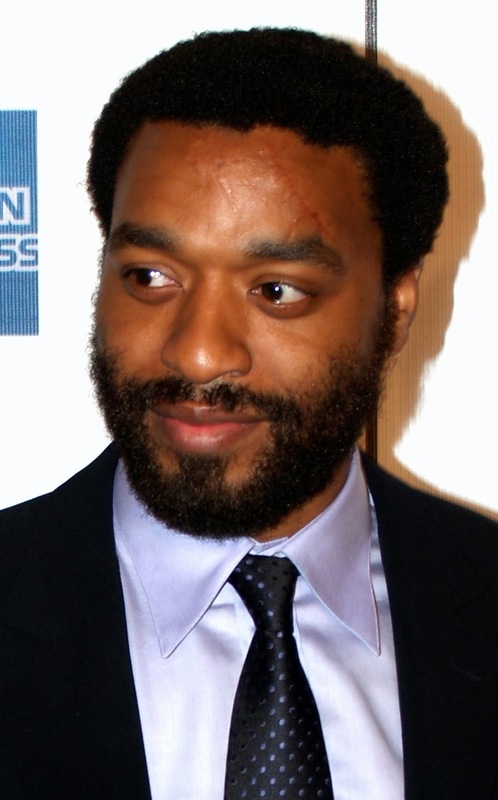 As I was watching him in "12 Years," I said out loud Academy Award. He just let it all hang out. 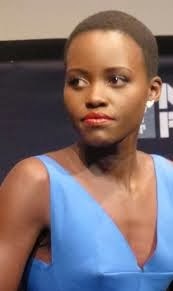 Best Supporting Actress: Again, I don't want Nyong'o to win. She needs to do more work first, but is Julia Roberts' part really a supporting role? If not, that isn't fair. I think Nyong'o will probably win. 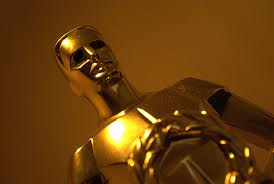 The Academy tends to reward first timers in this category. 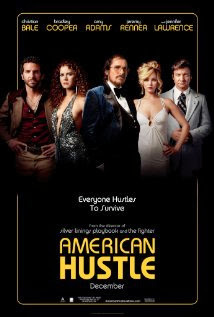 But Jennifer Lawrence stole the show in "American Hustle." Best Picture: I think"12 Years a Slave" is a shoe-in, but the sheer amount of work it took to make "Gravity" was amazing. And "Captain Phillips" was riveting, and there weren't even any women in it. I usually don't like films with all men. Best Director: If "12 Years a Slave" wins Best Picture it stands to reason that Steve McQueen should win for Best Director (and don't get him mixed up with that other Steve McQueen), but it doesn't always work that way. I vote for Alfonso Cuaron, because of what went into making "Gravity." 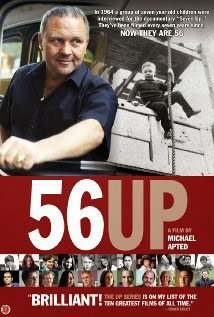 The only other category I am going to weigh in on now is Best Documentary - if 56 Up doesn't win Best Documentary, there is no god. 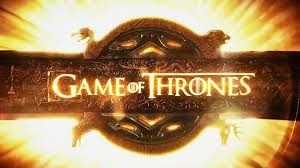 This series has followed 14 British children every seven years from the age of seven in 1964 to present and, in addition to the incredible determination it took to follow these fourteen people every seven years, it's riveting viewing. OK film lovers, what do you think? The con is on. As they say in the film, everything is a con and everyone is conning everyone. It's what we do in America. Jennifer Lawrence steals the show, but this is really an acting extravaganza - Christian Bale, Amy Adams, Bradley Cooper, DeNiro. Fresh script, great acting, humor...what more could you want? And a shout out to my friend, Barb, over at Living Richly in Retirement (a great blog, by the way), Jeremy Renner does you proud. Don't you love his pompadour? Hair seems to play a big role in this film. Rosy the Reviewer says...run, don't walk to see this. It will pick up many awards. Loved it! (and some you should be glad you did). I see the bad ones so you don't have t). 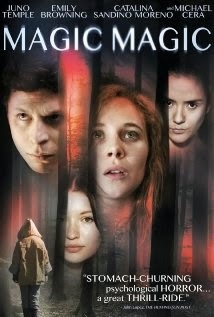 A naïve American girl goes on a road trip in Chile with friends of friends that turns into a nightmare. Rosy the Reviewer says...This is more of a nightmare for the viewer. Love Juno Temple, but she needs to find some better vehicles for her talent. Some of the things she has been in lately are wearing thin on me. Two veterans of the Bosnian War -- one American, one Serbian -- form an unlikely friendship that turns deadly. I didn't think I would like this one and John Travolta's accent got on my nerves at times. Rosy the Reviewer says...this isn't "Captain Phillips," but it's a tense game of cat and mouse. 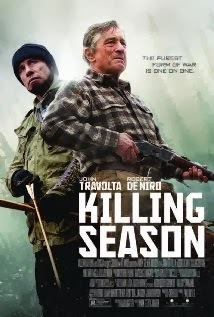 If you like movies about "human hunting," such as "The Most Dangerous Game, you will probably like this one. Five friends attempt to relive their attempt to conquer "The Golden Mile," an epic pub crawl of 12 pubs culminating in The World's End pub which they had failed to do 20 years before. In so doing, they, of course, encounter an alien invasion. 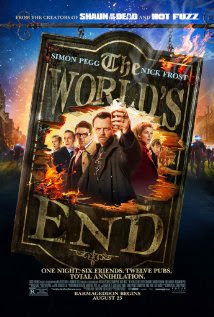 It is the third and final film in Simon Pegg's the "Three Flavours Cornetto trilogy," following Shaun of the Dead (2004) and Hot Fuzz (2007). Rosy the Reviewer says...If you liked "Shaun of the Dead" and/or British humor, you will enjoy this. I loved it. Billy Bob Thornton wrote, directed and starred in this film of two disparate families coming together in the South of 1969 for a funeral. Jayne Mansfield was a blonde bombshell actress who was famously decapitated in a horrific car accident. Thornton uses that allusion as a centerpiece for this story reminiscent of Tennessee Williams - think "Cat on a Hot Tin Roof." I can't decide if Robert Duvall is good in this or not. Rosy the Reviewer says...Thornton is a talented writer and actor, but this is no Slingblade. 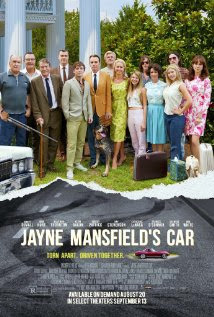 But if you like Wes Anderson or movies about quirky Southern families, you might like this. Think "All About Eve" in a business setting except with murder in mind. Remake of the movie Love Crime ("Crime d'amour" 2010) starring Kristin Scott Thomas, so I have to ask myself, why remake this film three years later? And what is really strange, the first one was French/English/Japanese and this one is French/English/German. Albeit the first one had more subtitles but other than that, a literal remake. De Palma is a big Hitchcock fan, so there is homage to "Psycho" and "Vertigo" and stylish cinematography and music a la Hitchcock. I notice that he has reversed the hair colors of the stars from the original: in the original the villain had dark hair and vice versa. It's the little things, I guess. Rosy the Reviewer says...What is happening to our great directors? Spike struck out this year with "Oldboy" and this one does not live up to De Palma's best work. After being attacked, an acclaimed actress and her psychiatrist husband retreat to a remote Mediterranean island where they meet a mysterious and troubled young woman who becomes a threat. William Baldwin's hair could have been a character all it's own. Warren is a model-turned-actress and you can tell. It was like a really, really bad Lifetime movie and that's giving Lifetime movies a bad name. Rosy the Reviewer says...Rosy, repeat after me. I will never, ever again put a movie in my Netflix queue based on the preview alone. "I will never, ever again put a movie in my Netflix queue based on the preview alone." 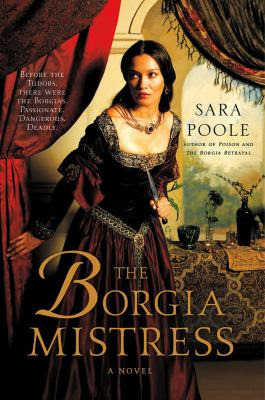 Book three in the "Poisoner Mysteries" series, Francesca Giordana, Borgia court poisoner, is once again center stage, this time to avenge her mother's death and save Pope Alexander VI from his enemies. Francesca is a plucky heroine, but the writing is sometimes a bit stilted at times. Rosy the Reviewer says...if you are a fan of historical fiction and mysteries, you should enjoy this. See you Tuesday where I will check in on my retirement, six months later! Check your local library first for books and DVDs. How tough to watch is '12 Years A Slave'? I've read many, many books on this horrible chapter in our history, most recently 'Incidents In The Life of a Slave Girl' by Harriott Jacobs, and 'The Warmth of Other Suns 'by Isabel Wilkerson, both outstanding, but I tend to shy away from film depictions of same. What is your opinion? I totally agree with you, Tamara. 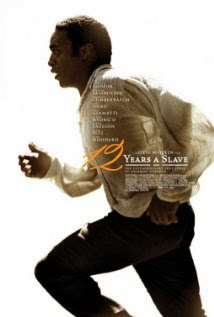 Watching "12 Years a Slave" was rough but I think it has to be so we will never forget that we humans were capable of making other humans our slaves and treated them so despicably. Likewise, I have trouble with films about the holocaust too, but again, we must never forget. Rosy, a follow up note to tell you we are thoroughly enjoying the films we are seeing nightly here at the Palm Springs International Film Festival. So different from the typical American commercial blockbusters, and so enjoyable. Last night we saw a Japanese charmer called 'The Great Passage', a sweet, gentle tale that would make me a regular movie goer 'at home' were more movies like this made. Thanks for the tip, Tamara. I will check that one out. I'm with you. There are so many films out there, especially the foreign ones, that are really good but not seen by many folks.